Why should you have to replace entire components of your home entertainment system every time the industry goes through a technological reset? If you've enjoyed your current model and tweaked your setup to get the most from it, it's hard to face the hassle and expense of swapping it out. NAD's Modular Design Construction (MDC) places many of the input/output and signal processing functions on removable modules which can be replaced as new technologies arise. That way, you only pay for the feature updates you want. The NAD T 187 V3 will handle almost any entertainment source you can throw at it, and hand it back to you polished and ready for impeccable performance. 4K video over HDMI? Old school AM/FM radio? Digital audio from an Apple TV®? Yes, yes, and yes, and quite a few more options besides. With all this versatility, this sleek component will serve as the cornerstone of your well-connected, high-end home theater system. The NAD T 187 V3 sports a refreshingly clean front panel. With 5 HDMI inputs and 2 HDMI outputs, the T 187 V3 stands ready to route the desired digital signal to your display devices with the touch of a remote button. NAD's "first, do no harm" philosophy with regard to the digital video signal ensures that the signal presented at the HDMI output will be identical in format to the one presented at the input, guaranteeing the integrity of the data stream. Discriminating attention has been brought to bear on the audio side as well. Ample inputs for your music and home theater sources plus numerous surround decoding modes make this unit endlessly versatile. 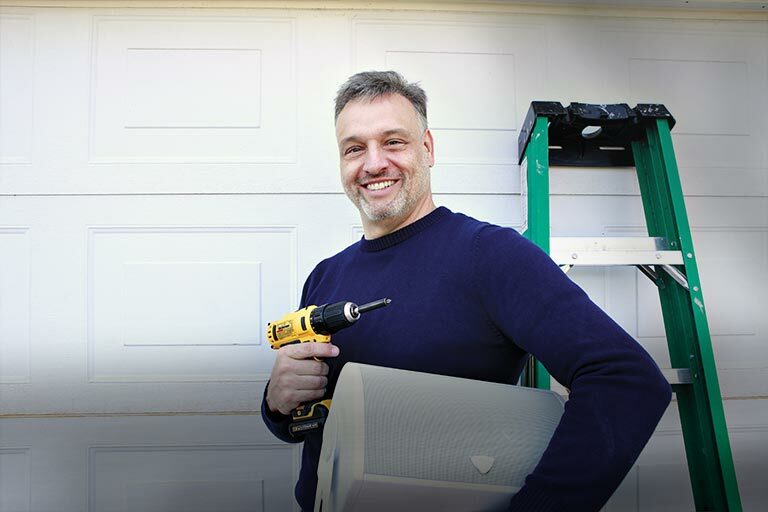 Audyssey MultEQ XT room correction allows you to custom-tune the T 187 V3 to match your particular room and speakers. And the system can extend its reach across your home with its support for 3 additional zones in addition to your main home theater room. Surround Sound Preamp Processor: The NAD T 187 V3 Surround Sound Preamp Processor is the perfect separate surround processor accompaniment to any high performance multi-channel power amplifier (sold separately). You'll find support for all the latest video format (including Ultra HD 4K) and surround sound formats (including Dolby Digital TrueHD, Dolby Digital Plus, and DTS-HD). The T 187 V3 also includes NAD's proprietary Modular Design Construction (MDC) for the added convenience and flexibility of future upgrades. 24-Bit/192kHz Burr-Brown DAC: The NAD T 187 V3 Surround Sound Preamp Processor employs a carefully selected, top-level 24-bit/192kHz Burr Brown DAC for the ultimate audiophile performance. Listening Modes: The T 187 V3 offers decoding for all the latest surround formats including Dolby Digital, Dolby TrueHD, Dolby Digital Plus, DTS, and DTS-HD Master Audio; as well as Dolby Pro Logic surround processing. Audyssey Technology: The NAD T 187 V3 features a full package of Audyssey audio technologies for optimal sound quality. Audyssey Dynamic Volume offers real-time volume adjustment, while Audyssey DynamicEQ improves your system's surround effects during low volume levels. Audyssey MultEQ XT automatically sets speakers to suit your room's listening environment and the speakers' characteristics. 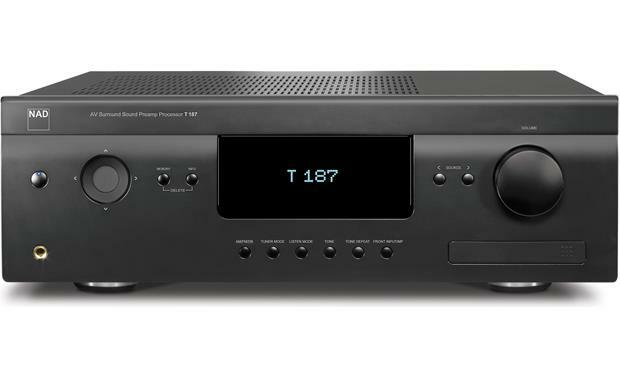 Stereo Modes: The NAD T 187 V3 also provides two-channel stereo and multi-channel stereo playback, as well as an analog bypass stereo mode. Audio Enhancements: The NAD T 187 V3 provides various audio enhancements to deliver a high-quality listening experience every time. Tone Controls: The T 187 V3 has three Tone Control levels; Treble, Bass, Center Dialog. Bass and Treble controls only affect the low bass and high treble leaving the critical midrange frequencies free of coloration. The Center Dialog control boosts the 'presence' of the midrange region improving intelligibility of speech. Tone Defeat gives one the choice of varying or completely bypassing the tone control section of the T 187 V3. Level Adjustments: The NAD T 187 V3 Surround Sound Preamp Processor provides the following level adjustments. Listening Mode Parameters: The T 187 V3 provides the following Listening Mode Parameter adjustments for Dolby Pro Logic IIx and DTS NEO:6. 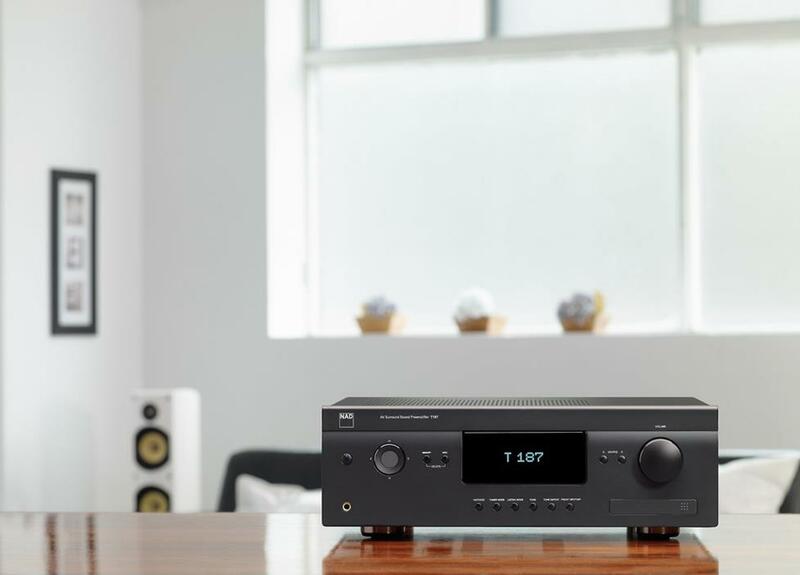 Multichannel Analog Inputs & Outputs: The NAD T 187 V3 is equipped with a 7.1ch analog input and 7.2ch analog pre-outs. 7.1Ch Input: The T 187 V3 features a 7.1 Channel input (Front left, Front right, Center, Surround left, Surround right, Surround Back left, Surround Back right, and Subwoofer) for connecting an outboard processor or multi-channel analog source. The 7.1 channel input can be assigned to eight of the nine inputs (source 5 is fixed). 7.2ch Pre-Outs: The T 187 V3 features Front left, Front right, Center, Surround left, Surround right, Surround Back left, Surround Back right and dual Subwoofer preamp outputs to connect the preamplifier to external power amplifiers. There is also a dedicated stereo output for Zone 2. Digital Inputs & Outputs: There are three coaxial digital inputs and three optical digital inputs. The inputs accept digital audio signals from a digital TV, Set top box, Blu-ray player, compact disc, DVD, LD, or other digital source components; each can be assigned to a specific source using the on-screen menu. There are also digital outputs; one coaxial and one optical. The digital outputs can be connected to MD recorders, CD recorders, DAT decks, or other similar components. Front-Panel Jacks: The NAD T 187 V3 is outfitted with a 1/4" headphone jack and 3.5mm Aux input on the front-panel. Headphone Output: The preamp features a 1/4" stereo headphone jack on the front-panel for connecting an optional pair of headphones. The unit's speaker outputs are automatically muted when a set of headphones is connected. 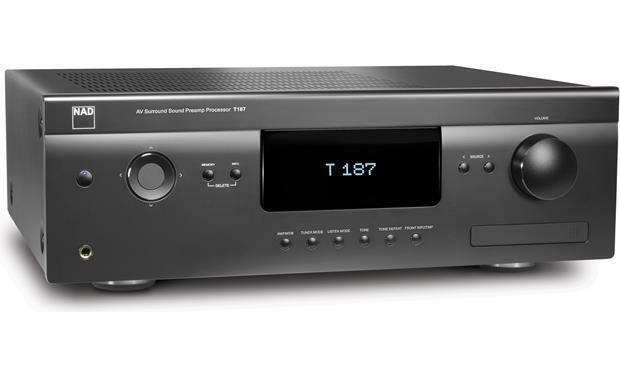 AM/FM Tuner: The NAD T 187 V3 features an internal AM/FM tuner that offers high-quality sound from your local radio broadcasts. The unit includes an external AM loop antenna, and external ribbon-wire FM antenna. RDS: The Radio Data System (RDS) permits sending small amounts of digital information using conventional FM radio broadcasts. The T 187 V3 supports two RDS modes; Program-Service Name (PS mode) and Radio-Text (RT mode). Not every FM station incorporates RDS in its broadcast signal. In most areas you will find from one to several RDS-enabled stations, but it is by no means impossible that your favorite stations will not be broadcasting RDS data. Presets: The T 187 V3 can store a mix of your 40 favorite AM, FM and XM radio stations for immediate recall. A twelve character name can be assigned to each AM/FM station preset. HDMI 2.0b: The NAD T 187 V3 has five HDMI 2.0b inputs, one HDMI 2.0b output, and one HDMI 1.4 output. The inputs are assignable using the AV surround sound pre-amplifier's on-screen menu. The two HDMI outputs are parallel so the same video signal is output through both and can be used simultaneously. 3D Ready: The NAD T 187 V3 supports 3D HDMI pass-through from connected 3D-compatible Blu-ray, games and broadcast devices to 3D-compatible HDTVs (all 3D components must be connected via HDMI. 3D provides a more engaging audio and video consumer experience. Note that special eyewear may be required for viewing 3D content. 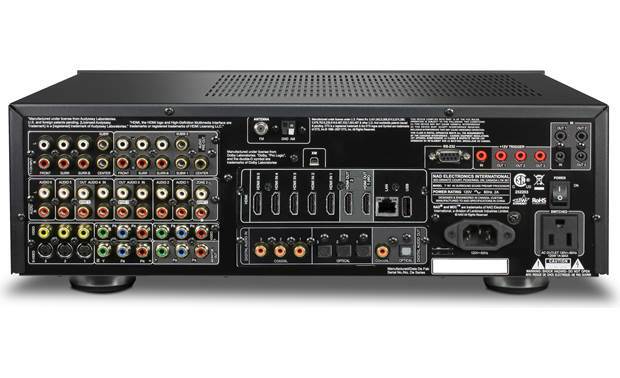 Audio Return Channel (ARC): If the connected TV has an HDMI ARC Input, the audio signal can be transferred from the TV (when its internal tuner is used) to the T 187 V3 through a single HDMI cable, so a second cable isn't needed. No Analog Video Decoding: Because NAD's VM300 4K MDC module is pre-installed, all of the T 187 V3's analog video input decoding from Composite, S-Video, and Component Video sources is disabled. Zones 2-3-4: In addition to the main listening room, you can also enjoy audio playback from a different source in other rooms of your home using the T 187 V3's Multi-Zone function. The T 187 V3 has three configurable Zones; Zone 2, Zone 3, and Zone 4. Each Zone consists of stereo RCA line-level output to connect an external receiver or integrated amp in other rooms of your home, allowing you to listen to 7.2ch surround in the Main Zone and 2ch stereo of a different audio sources in other rooms of your home. Each Zone allows independent source and volume control, with a simplified second-zone remote (ZR 7). Incompatible Zone Sources: HDMI, optical, and coaxial digital audio cannot be passed through Zone 2, 3, or 4. Note: Because NAD's VM300 4K MDC module is pre-installed, all of the T 187 V3's analog video input decoding from Composite, S-Video, and Component Video sources is disabled. BluOS-Ready: The NAD T 187 V3 offers the option of integrating BluOS Hi-Res multiroom audio into your NAD system through the addition of the BluOS kit (745BSUK, sold separately). Main Remote: The HTR 8 IR remote controls the T 187 V3 and is pre-coded with controls for other NAD components. The IR remote also features a "learning function" which allows you to teach commands to the HTR 8 from another remote controller, regardless of brand. The HTR 8's key-illumination can be set to remain lit for 0-9 seconds. A 'macro' command is a series of two or more remote codes issued automatically from a single key-press. The HTR 8 can store one macro on each of its function keys. Zone 2 Remote: The included ZR 7 is a discrete compact IR remote for controlling the Zone 2 features of the T 187 V3; it allows control of the Zone 2 volume and source selection, as well as other applicable functions. The ZR 7 will work from a different room using an IR sensor and hub or the IR sensor of a compatible NAD component in the second zone (either must be wired back to the location of the T 187 V3). Note: The ZR 7 remote control will only control Zone 2 applications. Zone 3 and Zone 4 can be configured and managed at the appropriate Zone OSD menu using the T 187 V3's front-panel navigations buttons, as well as the corresponding keys on the HTR 8 remote control. Power: The T 187 V3 will automatically go to standby mode if it receives a CEC standby command. On the other hand, if the T 187 V3 receives a CEC power up command, the T 187 V3 will correspondingly switch ON from standby mode. Source Switch: The T 187 V3 will automatically switch sources if another CEC device requests a Source change. For example, if Play is pressed on a BD Player with CEC, the T 187 V3 and TV with CEC will automatically switch to their respective input connections; the T 187 V3 switching to the HDMI input where the BD Player is connected while the TV will switch to its input where the T 187 V3's HDMI Monitor Out is connected. Audio System: The T 187 V3 will broadcast a CEC message indicating it is an active audio system. A CEC compatible TV will usually mute its audio output when this happens. When this option is enabled, the T 187 V3 will also respond to CEC volume and mute commands. For example, a CEC TV may forward the volume commands from its remote to the T 187 V3. NAD AV Remote App: Download the NAD AV Remote App on your your Apple iOS 6.0+ device to control the T 187 V3 from your your iPod touch, iPhone, or iPad. Through the app, you can select and control basic functions such as power, volume, source, and listening mode for all zones. You can also name sources, tweak receiver presets, adjust tone controls and trim levels, tune radio stations, and activate Audyssey room equalization, from anywhere in the house. Remote Connections: The NAD T 187 V3 is fitted with the following custom remote inputs/outputs. +12V Trigger Input/Outputs: The three +12V trigger outputs (3.5mm) let you turn on/off other devices along with the T 187 V3. The +12V trigger input lets you turn on/off the T 187 V3 from another device. Ethernet Port: The T 187 V3 is fitted with a Ethernet Port (RJ-45) to connect to your home network for IP control. With your PC and the T 187 V3 on the same network, it allows remote control of the T 187 V3 via compatible external controllers. MDC (Modular Design Construction): MDC ends the frustration of having to replace your entire AV preamp processor just to keep pace with the ever-changing world of AV electronics. NAD's most important recent innovation, MDC battles technology obsolescence by allowing you to upgrade the T 187 V3 with new connectivity and features as new technology becomes available. MDC places all the input circuitry on easily removable plug-in cards; your investment is protected because a single card, rather than the entire receiver, can be replaced when a new format is introduced. OSD (On-Screen Display): In addition to the unit's front-panel display, the T 187 V3 employs a simple, self-explanatory on-screen display menus system which will appear on your connected television. The OSD is available through the unit's HDMI output only. Source Configuration: The T 187 V3 is equipped with ten configurable Sources. A particular Source can be enabled or disabled, renamed, assigned analog and digital audio sources, video sources, AV Presets, Trigger settings, among other settings. AV Preset: The T 187 V3's 'AV Presets' allow you to customize your audio-video playback, and recall them with a single key-press. The parameters 'Listening Mode', 'DSP Options' and 'Tone Controls', together with 'Speaker Setup' and 'Display Setup' are stored together as a single AV Preset. You may create one AV Preset optimized for pop music and another for classical. One more AV Preset can be set up to recall each family member's favorite setting or one for fully cinematic home-theater playback, and yet another one for late-night movies; with each AV Preset fine-tuned to a particular scenario or preference. Sleep Mode: The Sleep Mode timer will switch the T 187 V3 to Standby mode automatically after a preset number of minutes (15-90 min. ).